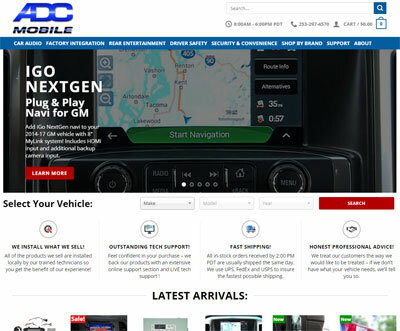 Welcome to the NEW and improved ADCMobile.com website! It has been grueling schedule of long days and nights, with well over 1000 hours of time invested, but the new ADC Mobile website has finally launched! The new platform finally allows us to do proper e-commerce website with the ability to display ALL of our product in a beautiful interface that is fully responsive for mobile use and includes a new vehicle picker – letting you choose your vehicle and return a set of products that are vehicle-specific for your ride! The vehicle picker has been a huge undertaking, as you can well imagine how many years, makes and models of vehicles that have vehicle-specific applications! We are always striving to be as accurate as possible in everything we do, so if you spot anything that should not apply to a vehicle or know of a good application that we overlooked, please contact us to let us know. We hope to propel our brand even further by adding hundreds of additional products, with pricing that we feel is extremely competitive backed as always with our total commitment to customer service. If you purchase your products from ADC Mobile, we will do everything in our power to insure that your experience will be the best you’ve encountered with any mobile electronics dealer, either online or locally!